The General Assembly currently meets under its president or secretary-general in annual sessions at the headquarters of the United Nations in New York City, the main part of which lasts from September  to December and part of January until all issues are addressed (which often is just before the next session's start). It can also reconvene for special and emergency special sessions. Its composition, functions, powers, voting, and procedures are set out in Chapter IV of the United Nations Charter. The first session was convened on 10 January 1946 in the Methodist Central Hall in London and included representatives of 51 nations. The United Nations is headquartered in New York City, in a complex designed by a board of architects led by Wallace Harrison, and built by the architectural firm Harrison & Abramovitz. The complex has served as the official headquarters of the United Nations since its completion in 1952. It is located in the Turtle Bay neighborhood of Manhattan, on 17 to 18 acres of grounds overlooking the East River. Its borders are First Avenue on the west, East 42nd Street to the south, East 48th Street on the north and the East River to the east. The term "Turtle Bay" is occasionally used as a metonym for the UN headquarters or for the United Nations as a whole. Chapter IV of the United Nations Charter contains the Charter's provisions dealing with the UN General Assembly, specifically its composition, functions, powers, voting, and procedures. In the common view, political representation is assumed to refer only to the political activities undertaken, in representative democracies, by citizens elected to political office on behalf of their fellow citizens who do not hold political office. However, the lack of consensus in the political literature on political representation belies this common view. Theorists of representation differ not only in their definition of representation but also, among other things, on what the duties of a representative are, who can be called representative and how one becomes a representative. In her seminal work on political representation, Hanna Pitkin defined political representation as, "a way to make [the represented] present again" and identified four views of political representation which, since her book's publication, have shaped contemporary debates on political representation. Recently, Jane Mansbridge has identified four other views of specifically democratic political representation which, although they are distinct, share some similarities with Pitkin's. On the other hand, Andrew Rehfeld has critiqued the failure of theorists like Pitkin and Mansbridge to articulate a purely descriptive view of political representation and has proposed a general theory of representation that recognizes that political representation can be and often is undemocratic. Mohammed Yasser Abdel Rahman Abdel Raouf Arafat al-Qudwa al-Husseini, popularly known as Yasser Arafat or by his kunya Abu Ammar, was a Palestinian political leader. He was Chairman of the Palestine Liberation Organization (PLO) from 1969 to 2004 and President of the Palestinian National Authority (PNA) from 1994 to 2004. Ideologically an Arab nationalist, he was a founding member of the Fatah political party, which he led from 1959 until 2004. The Palace of Nations is the home of the United Nations Office at Geneva, located in Geneva, Switzerland. It was built between 1929 and 1938 to serve as the headquarters of the League of Nations. It has served as the home of the United Nations Office at Geneva since 1946 when the Secretary-General of the United Nations signed a Headquarters Agreement with the Swiss authorities, although Switzerland did not become a member of the United Nations until 2002. Geneva is the second-most populous city in Switzerland and the most populous city of Romandy, the French-speaking part of Switzerland. Situated where the Rhône exits Lake Geneva, it is the capital of the Republic and Canton of Geneva. The agenda for each session is planned up to seven months in advance and begins with the release of a preliminary list of items to be included in the provisional agenda. This is refined into a provisional agenda 60 days before the opening of the session. After the session begins, the final agenda is adopted in a plenary meeting which allocates the work to the various Main Committees, who later submit reports back to the Assembly for adoption by consensus or by vote. The General Assembly may take action on maintaining international peace and security if the United Nations Security Council is unable, usually due to disagreement among the permanent members, to exercise its primary responsibility. If not in session at the time, the General Assembly may meet in emergency special session  within 24 hours of the request. Such emergency special sessions are to be called if requested by the UN Security Council on the vote of any seven members, or by a majority of the Members of the United Nations. The "Uniting for Peace" resolution, adopted 3 November 1950, empowered the Assembly to convene in emergency special session in order to recommend collective measures, including the use of armed force, in the event of a breach of the peace or an act of aggression. As with all Assembly resolutions, two-thirds of UN Members "present and voting" must approve any such recommendation before it can be formally adopted by the Assembly. Emergency special sessions have been convened under this procedure on ten occasions. The two most recent, in 1982 and 1997–2017, were about the status of the territories occupied  by the State of Israel. Credentials Committee –This committee is charged with ensuring that the diplomatic credentials of all UN representatives are in order. The Credentials Committee consists of nine Member States elected early in each regular General Assembly session. General Committee –This is a supervisory committee entrusted with ensuring that the whole meeting of the Assembly goes smoothly. The General Committee consists of the president and vice presidents of the current General Assembly session and the chairman of each of the six Main Committees. The Inter-Parliamentary Union is a global inter-parliamentary institution established in 1889 by Frédéric Passy (France) and William Randal Cremer. It was the first permanent forum for political multilateral negotiations. Initially, the organization was for individual parliamentarians, but has since transformed into an international organization of the parliaments of sovereign states. The national parliaments of 178 countries are members of the IPU, and 12 regional parliamentary assemblies are associate members. The IPU has permanent observer status at the United Nations General Assembly. The tenth emergency special session of the United Nations General Assembly centers on the Israeli–Palestinian conflict: the ongoing dispute and conflict over the West Bank and the Gaza Strip. The session was first convened in 1997 under the president of the General Assembly, Razali Ismail of Malaysia. This occurred when the Security Council failed to make a decision on the issue at two different meetings. The session remains adjourned. A United Nations resolution is a formal text adopted by a United Nations (UN) body. Although any UN body can issue resolutions, in practice most resolutions are issued by the Security Council or the General Assembly. The United Nations General Assembly Sixth Committee the is the last of the six main committees of the United Nations General Assembly. The Sixth Committee is the primary forum for the consideration of legal questions in the General Assembly. The United Nations issues most of its official documents in its six working languages: Arabic, Chinese, English, French, Russian and Spanish. Many are also issued in German, which in 1973 gained the status of "documentation language" and has its own translation unit at the UN. 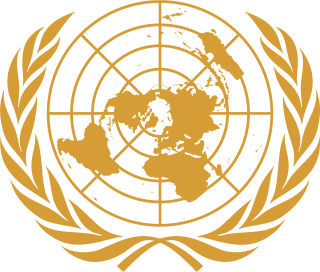 The official documents are published under the United Nations masthead and each is identified by a unique document code (symbol) for reference, indicating the organ to which it is linked and a sequential number. There are also sales publications with distinctive symbols representing subject categories, as well as press releases and other public information materials, only some of which appear in all the official languages. The first emergency special session of the United Nations General Assembly was convened on 1 November and ended on 10 November 1956 resolving the Suez Crisis by creating the United Nations Emergency Force to provide an international presence between the belligerents in the canal zone. The emergency special session was convened due to the failure of the Security Council to resolve the instability at the Suez Canal, invoking "Uniting for Peace" resolution which transferred the issue from the Security Council to the General Assembly. On the fourth day of the session the Canadian representative, Lester B. Pearson, introduced the concept of a UN police force. The creation of the United Nations Emergency Force was approved by the General Assembly with 57 supports and zero opposes. The vote had 19 countries abstaining, including the United Kingdom, France, Egypt, the Soviet Union and several Eastern European countries. The Holy See is not a member of the United Nations but was granted permanent observer state status on 6 April 1964. In that capacity, it has the right to attend all sessions of the United Nations General Assembly, the United Nations Security Council, and the United Nations Economic and Social Council to observe their work. Accordingly, the Holy See has established permanent observer missions in New York and in Geneva and has been able to influence the decisions and recommendations of the United Nations. The Sixty-sixth Session of the United Nations General Assembly opened on 13 September 2011 at 15:00 and was presided over by former Qatari permanent representative to the UN Nassir Abdulaziz Al-Nasser. The session ended on 18 September as al-Nasser symbolically passed the gavel to the president of the next session, Vuk Jeremic. The Seventieth Session of the United Nations General Assembly opened on 15 September 2015. The President of the United Nations General Assembly is from the Western European and Others Group. ↑ CHARTER OF THE UNITED NATIONS: Chapter IV Archived 12 October 2007 at the Wayback Machine . United Nations. ↑ United Nations Official Document. "The annual session convenes on Tuesday of the third week in September per Resolution 57/301, Para. 1. The opening debate begins the following Tuesday". www.un.org. 1 2 General Assembly of the United Nations. United Nations. Retrieved 12 July 2013. 1 2 Population, total | Data | Table. World Bank. Retrieved 12 July 2013. ↑ "History of United Nations 1941 – 1950". United Nations. Archived from the original on 12 March 2015. Retrieved 12 March 2015. ↑ (in French) "Genève renoue avec sa tradition de ville de paix", Le Temps , Thursday 16 January 2014. ↑ "Research Guide: General Assembly". United Nations. Archived from the original on 21 October 2013. ↑ "General Assembly of the United Nations". ↑ "Article 17 (1) of Charter of the United Nations". ↑ "Articles 11 (2) and 11 (3) of Charter of the United Nations". ↑ UN Security Council : Resolutions, Presidential Statements, Meeting Records, SC Press Releases Archived 2 December 2012 at the Wayback Machine . United Nations. Retrieved 12 July 2013. ↑ United Nations Department of Management. United Nations. Retrieved 12 July 2013. ↑ "Articles 18 (2) and 23 (1) of Charter of the United Nations". ↑ "Article 20 of Charter of the United Nations". ↑ "UN GA Special Session on HIV/AIDS". United Nations. Retrieved 16 December 2015. ↑ "Event: Special Session of the General Assembly on the Follow-Up to the Programme of Action of the ICPD | Sustainable Development Policy & Practice | IISD Reporting Services". sd.iisd.org. Retrieved 16 December 2015. ↑ "Special Session of the General Assembly UNGASS 2016". unodc.org. Retrieved 16 December 2015. ↑ Fassihi, Farnaz, "U.N. Conference on Drugs Ends Without Shift in Policy", Wall Street Journal, 22 April 2016. Retrieved 25 April 2016. ↑ Belk, Joey (19 March 2016). "How to travel in one of the most dangerous cities in the world and still be fresh". Nation19 Magazine / APDTA. Nation19 Magazine / APDTA. Retrieved 2 February 2017. ↑ "The Museum of Drug Policy Wants You to Speak Your Truth | Mass Appeal". Mass Appeal. 20 April 2016. Retrieved 3 February 2017. ↑ "Brazil's President Rousseff to be First Woman to Open United Nations". Fox News Channel. 20 September 2011. Retrieved 29 September 2015. ↑ "Historical Personalities and Diplomats: Oswaldo Aranha". Brazilian Ministry of External Relations. ↑ "UN: King Felipe VI of Spain and Ban Ki-moon Discuss Western Sahara". Morocco World News. 24 September 2014. Retrieved 25 September 2014. ↑ "In U.N. Speech, Obama Vows to Fight ISIS 'Network of Death'". The New York Times . 24 September 2014. Retrieved 25 September 2014. ↑ UNGA Emergency Special Sessions. United Nations. ↑ Tenth Emergency Special Session. United Nations. Retrieved 13 November 2014. 1 2 "Main Committees". United Nations General Assembly. United Nations. Retrieved 19 June 2018. ↑ "Subsidiary Organs of the General Assembly: Committees". United Nations General Assembly. United Nations. Retrieved 19 June 2018. ↑ "Subsidiary Organs of the General Assembly: Commissions". United Nations General Assembly. United Nations. Retrieved 19 June 2018. ↑ "Subsidiary Organs of the General Assembly: Boards". United Nations General Assembly. United Nations. Retrieved 19 June 2018. ↑ "Subsidiary Organs of the General Assembly: Assemblies and Councils". United Nations General Assembly. United Nations. Retrieved 19 June 2018. ↑ "Subsidiary Organs of the General Assembly: Working Groups". United Nations General Assembly. United Nations. Retrieved 19 June 2018. ↑ The PGA Handbook: A practical guide to the United Nations General Assembly (PDF). Permanent Mission of Switzerland to the United Nations. 2011. p. 18. ISBN 978-0-615-49660-3. ↑ "Report of the Secretary-General in Larger Freedom towards development, security and human rights for all". ↑ "In Larger Freedom, Chapter 5". United Nations. ↑ Assembly, General. "Venezuela, Bolivarian Republic of H.E. Mr. Jorge Valero Briceño, Chairman of the Delegation". www.un.org. ↑ "REVITALIZATION OF THE WORK OF THE GENERAL ASSEMBLY" (PDF). Globalpolicy.org. Retrieved 11 January 2015. ↑ "The Role of the UN General Assembly". Council on Foreign Relations. Retrieved 11 January 2015. ↑ David Gelles (21 September 2017). "It's the U.N.'s Week, but Executives Make It a High-Minded Mingle". The New York Times. Retrieved 22 September 2017. 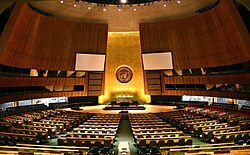 Wikimedia Commons has media related to United Nations General Assembly .